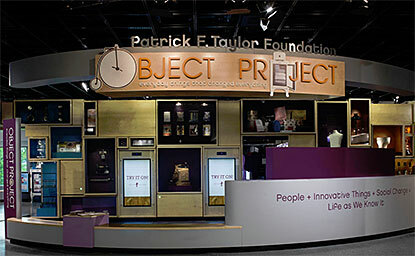 In the Patrick F. Taylor Foundation Object Project, visitors consider the impact of innovative things on everyday life in the past. This is a place to celebrate some everyday things that changed everything through approximately 250 objects displayed within a 9-by-40-foot sculpture that forms the spine of the learning space, in the Wallace H. Coulter Plaza. Stories and activities center on bicycles, refrigerators, ready-to-wear clothing and other common objects with uncommon stories.